MUSSER: Our first and most important top-line message from the Boeing company is to say, “Thank you,” to President Trump, Speaker Ryan, Leader McConnell, and members of Congress who passed this historic, once-in-a-generation tax reform bill that’s gonna allow us to make a lot more investments that will make us more competitive. That will allow us to compete globally, more effectively. Invest in research and development and — most importantly — in our most important asset, which is our people. And so the announcement today that our CEO Dennis Muilenburg made as the bill just passed into law sends an important message to the American manufacturing and global community about the significance of this bill. MUSSER: You know, if you look at the growth in the American economy after the Kennedy tax cuts, after the Reagan tax cuts, and now after the Trump tax cut, what I would say to those who might be skeptical is, “Watch us.” Dennis Muilenburg, our CEO, made a decision to make an immediate investment back in our people and our economy. 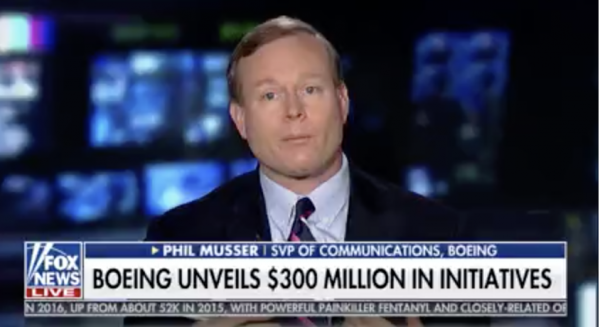 RUSH: So the Boeing senior vice president for communications wants everybody to know how much Boeing appreciates this, how much they love it, how much they’re gonna utilize it to grow, to invest in people, hire people, more jobs. Thanking the president for it. Does any of this raise a question among some of you? Well, let me explain when we come back. I gotta take a quick time-out here the bottom of the hour. But where are the Democrats in all this uplifting stuff? 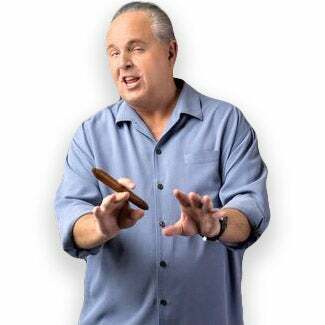 RUSH: Now, here’s my question, folks. I shouldn’t have asked the question of you the way I did, “Did something occur to you?” because it would mean you could read my mind. But we just heard two sound bites from, essentially, the corporate spokesman for Boeing. Just rollicking happy, singing the praises of the tax bill, the specifics of it. What it means for Boeing, what it means for people who works at Boeing, what it means for people who do business at Boeing, what it means for the country. You know, Kraft’s primary business is in paper and boxes, cardboard boxes. That’s the Kraft family primary business. Of course, now the Patriots may dwarf it in terms of value, but Robert Kraft’s businesses have always been a great indication of economic activity. I mean, the more boxes, cardboard, paper and so forth they’re manufacturing, the greater the economic growth is. The president said today during the signing ceremony for the tax cut that Bob Kraft called him last night and is just happy as he could be. He is gonna open a new paper plant, construction plant, whatever, in North Carolina. So here you have… Wherever you look, the five companies from yesterday or two days ago: AT&T, Fifth Third, Wells Fargo, Comcast, now Boeing. I mean, they’re all getting in on this, and they’re all ecstatic. They’re all extremely happy, and it tells me: Look at the arduous, competitive circumstances they have been up against for the last 30 years. With somebody like Obama in office, it was understood there was never gonna be a tax cut. So they had to do what they could do to make their businesses function easier, and that was corporate crony capitalism: Sidle up to Obama as best they could. Obama was not the kind of guy you wanted mad at you. You know, so you get cozy. You sidle up. You pretend you want to do business with him like the GE people did, and what you end up with is crony capitalism or crony socialism, and that’s not good for anybody involved. But that’s what happens when you have a potentially autocratic, punitive leader. Now you have Trump, who is essentially just removing impediments, removing roadblocks. You know, getting all the things in people’s way out of their way so that growth and investment and opportunity is up to them. Regulations are falling by the wayside. They’re all happy about it. Now, over here, outside all of that, is the Democrat Party mad as they can be — livid — instead of trying to get in on this. Instead of trying to get in on what is going to be a newfound prosperity, on a new round of economic growth — instead of trying to get in on this — they are purposely standing aside. They are fuming, and they’re mad, and they’re trying to make as many other people mad as they can. And they’re using their buddies in the media to lie about how bad this is and about how nobody is gonna really get a tax cut. This is all a lie that Trump is telling. And that lie is gonna be exposed starting in February when people see larger paychecks. Now, we had a caller earlier this week who basically asked me in his own words why the Democrats are not interested in supporting policies that would make their voters more prosperous. And I had an answer. The answer is the same thing today as it was then and it’s gonna be the same thing next year. The Democrats don’t want individuals prospering if government isn’t involved. The Democrat Party has built a political party around identity and victimhood. As many people as they can make into victims, they do. Once you, as a Democrat, or as a voter, as a human being. Once you believe yourself to be a victim, then you immediately no control over your life, by definition. When you’re a victim, everything that happens to you is somebody’s fault. Everything that happens to you is outside your control. You’re helpless! You’re a victim. You’re a victim of evil Republicans, evil capitalists, evil what have you. The Democrats position themselves as the saviors of all of these identity groups and victims. And if there is prosperity to be had, if there are rising standards of living, it better be traceable to government. It better be traceable to a government program. It better be traceable to something the Democrats say they’re responsible for or it doesn’t count. The bottom line is the Democrats don’t want their voters — other than the super-rich donors in Hollywood and New York. But the average, ordinary Democrat voter, Democrats don’t want ’em to prosper unless it’s because have a government program or government action that’s directly traceable to the Democrat Party. That reality just stuns me. Why would a political party actively want to sit out on this kind of excitement? Now, I understand. We want to sit out the things that make them excited. But the things that make them excited are not beneficial to us. The things that excite them are punitive to us! The things that excite them end up harming us, primarily by virtue of the growth of government and the loss of little individual bits of liberty and freedom here and there. Such things as versus climate change to net neutrality. Whatever the issue that can grow government, whatever the issue that can give government more control over everything in the country, because individuals can’t be trusted with it. Well, we don’t sidle up to that and we don’t want to be part of that because that’s injurious to us. But this isn’t injurious to anybody. Keeping more of what you earn is not injurious! It doesn’t hurt you. It doesn’t damage you. Encouraging prosperity, promoting liberty, promoting self-reliance, rugged individualism, promoting the pursuit of happiness doesn’t hurt anybody. But in the Democrat world it does. In the Democrat world, that’s a nonstarter. So in the midst of all of this outpouring of happiness and encouragement and excitement over the tax cut, what do we get from the Democrats? That they’re gonna win the House in 2018 ’cause of this! They’re gonna win the House ’cause people don’t like this and they’re gonna win the House ’cause,. “We hate Trump! People hate Trump! Trump’s hatred.” You know, I think you people better look again because I don’t think that the country sees Donald Trump today the way they saw him nine months ago, and I don’t think they see him at all the way you do. You better make tracks on getting with it ’cause you’re about to be left behind in a gigantic stampede. I should shut up and not give them any heads up.